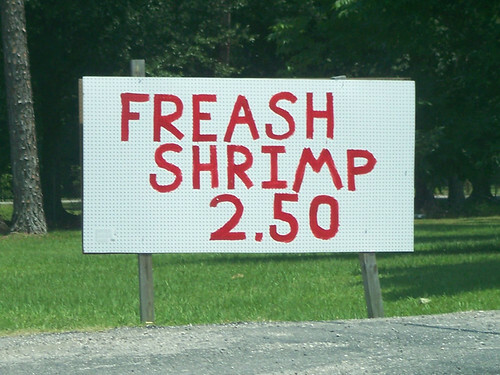 Southern Spellin Bee – Freash Shrimp Yall! | JIFFY FEET – Southern Fried Awesome! Southern Spellin Bee – Freash Shrimp Yall! Southern Spellin Bee – Freash Shrimp Yall!, originally uploaded by jiffyfeet. If you had to guess which one of these two words would most likely get misspelled, i definitely wouldn’t have picked Fresh! Cause with all the variations on Shrimp (aka, Skrimp, Shremp, Shirmps) You typically get slang thats more than likely done on purpose. But this is def my new fav that Im gonna be using in my vocab, haha. Them Kicks are Freash (Fr-eeee-aa-shh) Boy! I have to give props to jacksonville confidential for uncovering this one first, But my boy Bruce Bruce got a better pic. He was just a little behind sending it.